Gaga apparently wanted Britney Spears and Linday Lohan to appear in the video too. 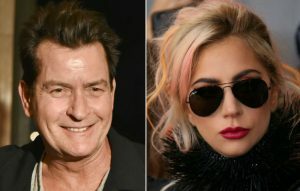 Charlie Sheen has claimed that Lady Gaga once offered to give a naked lap dance in an “X-rated” music video she was planning. The actor recalled an unexpected phone call he received from Gaga during his recent appearance on The Kyle and Jackie O Show on Australian radio station KIIS 106.5. Sheen said the conversation then turned philosophical and the pair “never spoke again”. The X-rated music video, obviously, never came to fruition. Over the weekend, the BBC was criticised for omitting the LGBTQ lyrics from Lady Gaga’s hit ‘Born This Way’ during a performance on Let’s Sing & Dance For Comic Relief. The singer recently appeared on RuPaul’s Drag Race and fooled contestants by dressing as a drag queen herself. The post Charlie Sheen says Lady Gaga offered to give him a naked lap dance appeared first on NME.